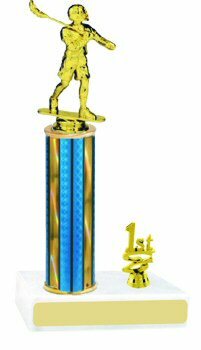 Traditional lacrosse trophies with round 1-3/4 inch prism hologram plastic column. Customize your award by choosing your base, column color, trim and figure. Three lines of free custom imprinting on a gold tone plate will make this trophy a real treasure. * Standard figure is 5" actual height may vary on the figurine you choose. * Some figures may have an added cost. This item will ship within 5-7 business days. Free FEDEX ground shipping on all prepaid orders over $100 in the continental U.S. When timing is important please let us know when you would like your order so we can make sure you get it on time.